The Garden Makeover Company (GMC) offers a range of landscape design and gardening services. GMC was started in 2002, and while it has broadened in scope, all work is personally supervised by the owner of the company, Connie J. Bowers. The business is based in Silver Spring, Maryland. Connie Bowers, the owner and operator of the Garden Makeover Company, trained in landscape design and horticulture after deciding to transition her passion for gardening into a full-time pursuit. With a Master’s degree in public policy, Connie worked for many years in the public sector before initiating her studies at the George Washington University Landscape Design Program and the U.S. Department of Agriculture Graduate School, ultimately obtaining separate Professional Certificates in Landscape Design, Horticulture, and Woody Landscape Plants. Connie also was certified as a Landscape Consultant / Judge by the Landscape Design Council of the National Federation of Garden Clubs. She is a pest control applicator certified by the Maryland Department of Agriculture and, in this regard, emphasizes integrated pest management (IPM) practices. 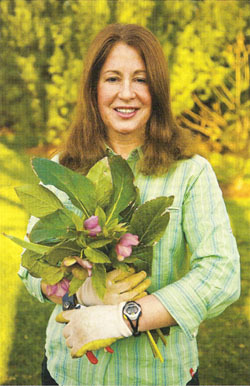 Connie was interviewed by the Washington Post and featured in an October 11, 2007, article, “For Your Yard’s Sake, Spending Money Like Water.” Choice plantings, particularly for the first years after installation, need careful watering, which can be challenging during times of drought and water shortages. Connie helps clients design watering methods that are appropriate to promote plant vitality, while being conscientious of environmental considerations. Here are Excerpts from the Article. Connie was also interviewed by a Washington Post writer for an article on garden hoses that was published in many newspapers, including the Hong Kong Standard. Here are Excerpts from the Article. Connie’s work as a garden coach and consultant was recognized and featured in the Washingtonian Magazine in a piece titled “Can You Help Me?”. The article is about how garden consultants can do anything from giving advice about plants to designing a garden. Following is a portion of the article. Shortly after Laura Davis bought a house in Silver Spring, she and her sons planted 300 tulips. But just as the plants were about to bloom, deer ate all but ten of them. For the next couple of years, Davis bought books, took classes on gardening, and tried to create a beautiful yard, but the result always fell short. She didn’t want to hire a gardener; she wanted to do the work herself with the help of her sons. Then she saw a flier that landscape designer and garden consultant Connie Bowers, also of Silver Spring, had posted on the bulletin board of the local YMCA. Davis called her. Bowers walked through the yard, looked at Davis’s interior-decorating style, and asked what colors she liked and what she wanted in a garden. Then Bowers went home and drew up a computerized garden plan, adding snapshots and details about plant and light conditions and the care of each plant she was suggesting. “It’s a really accurate design plan where it’s all laid out with the correct footage, including the patio and hot tub,” Davis says. The plan included plants that would bloom at different times over about seven months as well as flowers, shrubs, and herbs that deer find unappealing, such as holly, cotton lavender (santolina), thyme, and catnip (nepeta). Davis and her sons went to work, and three years later their yard is a showpiece. “People say they go out of their way to drive by my house to see what’s in bloom,” she says. For $40 to $175 an hour, garden coaches and consultants will come to your home and do anything from design a garden to identify plants, explain why your azaleas won’t bloom to teach you to prune bushes. Some are certified arborists and can advise you about trees as well. Consultants don’t work only with beginners; even seasoned gardeners sometimes seek a second opinion or fresh ideas. There’s no formal distinction between a consultant and a coach, says Kathy Jentz, editor and publisher of Washington Gardener magazine, but those who call themselves consultants tend to have certificates or degrees in landscape design or horticulture, while coaches are generally people who have gardened for years and developed expertise that way as well as through research or volunteering in a community or botanical garden. But because not everyone uses the terms in the same way, this article uses the word “consultant” for both. For three years before Laura Davis, the Silver Spring mom, hired Connie Bowers, she learned through trial and error—placing plants too close together, choosing plants that didn’t do well in her yard and some that just didn’t look good together. She found using a garden coach to be a good financial move.